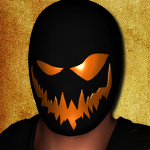 Pesadilla (or Nightmare, in English) is a rookie luchador noted for his extreme willingness to take a bump, his creepy mask, and his even creepier laugh. The man behind the mask, Javier 'Javi' Lopez, claims to be self trained through avid examination of a wide range of tapes of every Lucha company from OLLIE to ZEN and this scattershot education shows in his schizophrenic ring work which can go from technical to comedic to heelish with little regard to psychology. Is there a place for such a man in the wrestling world? Time will tell. To this point, El Pesadilla does not have achievements to speak of. Last edited by Eisen-verse : 08-04-2017 at 04:18 PM.